If there has been a day in my life that I haven’t had a book in my hand since I was first able to sound out c-a-t, I don’t remember it. I used to bring them home from the library in my yellow paper route bag—thirty or forty big, fat tomes from the grown-up section—and my mother would scream, “For God’s sake, go out and play with the other kids! People are gonna think you’re crazy!” But if you’ve got to be crazy, then I say book-crazy is the way to be. Although I was fascinated by the written word and surrounded myself with it at every opportunity, something in me was convinced that the actual becoming of a writer was a thing so sacred, so unattainable, it was an honor to which I could never aspire. So instead of writing, I majored in English at Barnard, and then I owned an antiquarian bookstore at Amsterdam and 118th, and then I took classes on bookbinding and restoration, all the while amassing a huge personal library of rare and wonderful books, like a first printing of The Nursery Alice and a Shakespeare & Co. sixth printing of Ulysses. When my little indie bookstore went the way of many indie bookstores, I had a plan. I was going to go up the street to CCNY and get an M.A. in Literature. I hadn’t been in school for many years, so I was feeling nervous and thought I’d start with something easy—children’s literature. After all, I’d read a lot of it. Professor Pam Laskin came in and seemed so nice, I relaxed a little. Then she started explaining the syllabus. It seemed we were not only going to read children’s literature—we were also going to write it. I almost ran out the door. And that, as they say, was that. Pretty soon I was giving poetry readings, contributing to literary journals, and teaching in the Poetry Outreach Program. Though I was afraid at first to take these risks, they got easier every time. I’ve built up a considerable oeuvre over the years, including some rather saucy verse renditions of Andersen’s Fairy Tales, a series of children’s poems, a novel called The F.U. Diet that is nearing completion, and a screenplay entitled All I Want for Christmas (co-authored with Margarette Gulinello) that is presently making the rounds. And, of course, poems. Lots and lots of poems. Each poem is my favorite while I’m writing it. I like form, and playing with form. Usually, the least visible form I’ll use is blank verse, and I’ve even been known to venture giddily into sestinas and ghazals. My thesis was called “The English Major’s Guide to Eating a Hot Fudge Sundae, ” and Marilyn Hacker and Pamela Laskin, my personal fairy godmothers, were the readers. My favorite piece in my thesis? A 479- line completion of Chaucer’s unfinished “The Cook’s Tale.” I wrote it in Middle English, and then did my own modern English translation. Bliss! Image by Ozyman. Sourced via Flickr. Post by Karen Clark, the Poet in Residence at Library Hotel. 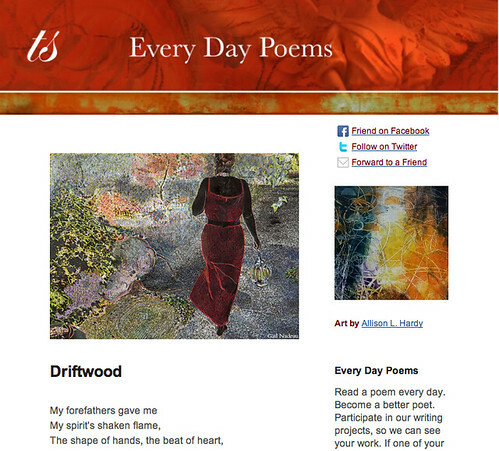 Browse more Journey into Poetry. Read a poem a day, become a better poet. In January, we’re exploring the theme Doors and Passageways. Library Hotel Picks a Poetry Garden Winner! What a great title for a thesis. I took two courses in college with a Chaucer expert, one solely on Chaucer and one on medieval narrative. I was intimidated by the scholarship of my professor in the first but loved the second class I took with her. I can’t say I’ve read Middle English since but I haven’t forgotten the experience. How cool to be poet-in-residence at a hotel. Would like to know more about what you do there, Karen. I am finally getting my feet down off the pink cloud that was my stay at The Library Hotel. Totally agree with you – the Middle English thing was intimidating on the first day of class, but then, as you say, it sort of clicked, and became huge fun, especially since Chaucer has a bawdy streak a mile wide. Thus far, what I am doing at the hotel is consultation with the hotel management when there is a poetry contest sponsored by the hotel, as well as batting out the occasional poem (including a two page apology in rhymed couplets for having forgotten to tip the housekeeper when we left – I thought my husband had taken care of it, and he thought I had, so we slipped a poem and some $$ into an envelope and mailed it in! )and of course offering the individual poetry workshops to guests. I am very excited about all of this, as you may imagine. One of the nicest things about my stay was the extraordinary overall bookishness of the area. On Friday night, we walked 4 blocks down Madison Avenue to take advantage of Free Admission Night at the Morgan Library, where we reveled in Edgar Allan Poe’s manuscripts, including a handwritten copy of “The Bells” that had (horrors!) scorch marks at the edges of the paper. To think that it was nearly burned! The next morning, after checkout, we were walking towards Fifth, planning to hail a cab, and I noticed for the first time that all of 41st St. between Madison & Fifth is inlaid with bronze plaques with quotations on them about the joys of books and reading. (It took me a while to get down the street.) Now, I have lived in NYC for 34 years, and somehow I never saw this before. And then, as soon as we got to Fifth, I saw that the NYPL main branch was having an exhibition on Children’s Books, and I dragged my dear, longsuffering husband AND the suitcase up the steps, plockety-plockety-plock, and in we went. Well, it was fabulous. For one thing, it was huge, And beautifully laid out, with interactive displays. They had re-created the Great Green Room from “Goodnight, Moon.” There was a huge silhouette of a Wild Thing carved out as a doorway through a fur wall. They had P.L. Travers’ parrot-headed umbrella, and Christopher Milne’s Winnie the Pooh, Tigger, and all the rest. It was perfectly thrilling, and very rewarding to see that the place was absolutely packed with happy little children on a Saturday morning, too!The parents were having a blast, pointing out favorite objects from iconic books, and – well, as I say, it was all just wonderfully bookish. Thank you for reading about My Journey Into Poetry – now, please tell me about yours! Such a wonderful journey. I love how you took each new turn as an opportunity. Such openness to life. I, too, want to know more about your work at Library Hotel. And…How did you find them, or they you? Gentle Readers – I am thrilled to be the newly-appointed Poet In Residence at the Library Hotel, and as for what I will do there – that is still in the process of development. A project in the works for next month will be to offer guests of the hotel workshops in writing sonnets and love poems, as The Library Hotel is one of the great romantic destinations and is much sought-after for Valentine’s Day! I wish I could reply at greater length, but Adele Gutman, who is the vice president of Marketing, Sales & Revenue at the hotel, has invited me to meet with her and then spend the night at the hotel, so I am madly flinging things into an overnight bag for a fabulous Staycation (since I live in Manhattan. )Not forgetting my copy of Angela Carter’s “Burning Your Boats” – although, thank heavens, there would be PLENTY to read if I didn’t bring it. It is, after all, the Library Hotel!